Elac Adante AF 61 Speaker is the floorstanding alternative to the AS 61 made for uncompromising listeners who want a speaker that does it all, at a price as satisfying as its sound. Earn 5199 loyalty points when you order this item. Elac Adante AF 61 Floorstanding Speaker boasts dynamic performance and daring design, the ultimate Adante breaks boundaries and challenges the limitations of traditional designs. 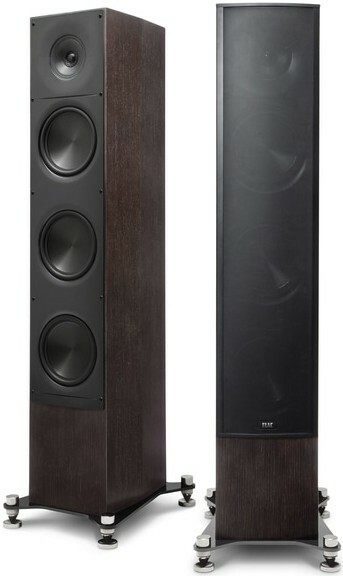 Engineered and built to quality standards that exceed every expectation, the AF-61 Floorstander delivers performance that will satisfy the most demanding audiophile sound. After turning the audiophile world on its collective ear with the remarkable Debut and Uni-Fi Series loudspeakers, ELAC undertook the mission of creating one of their most ambitious speakers to date. Adante will surely redefine your concept of what it is possible for an affordable loudspeaker to achieve. Adante’s advanced design starts with a precision-built cabinet that features Interport-Coupled Cavity bass loading to exploit the highest performance from new active and passive bass drivers. Complementing Adante’s custom low-frequency drivers is the all-new concentric midrange/tweeter, a natural-sound wonder engineered expressly for the Adante series. To make sure they look as good as they sound, each Adante cabinet features a furniture-grade finish in a choice of gloss white, gloss black or genuine satin walnut veneer. The face of each cabinet is an elegant, bonded-aluminum front baffle for maximum rigidity, contoured to incorporate waveguides that ensure optimum dispersion from each driver. Hugely complex but with benefits that are immediately audible, an Interport-Coupled Cavity cabinet renders clearly superior performance in the reproduction of low frequencies. 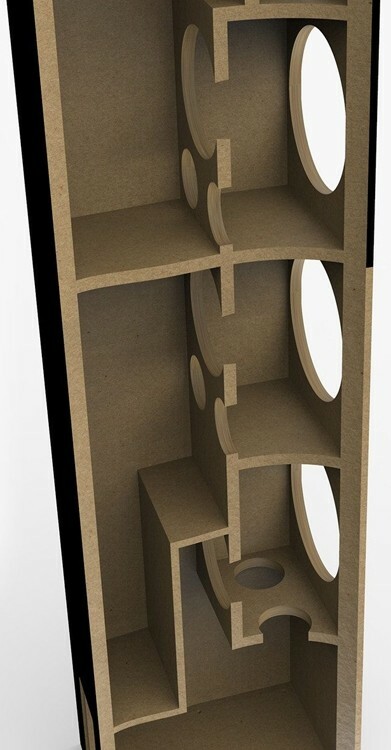 The engineering challenges and complicated manufacturing requirements make it rare in the world of affordable speakers. Each Adante cabinet is actually multiple enclosures in one. The concentric midrange/tweeter is isolated in its own space within the cabinet and the woofer complement, comprising an active and passive driver, occupies a divided chamber vented internally with dual ports. For AF 61, three double chambers isolate each woofer pair from the other. It is vital that the entire enclosure is not externally ported at all as this will produce noise and other distortion artifacts if the speaker is overdriven. A coupled-cavity design means that the active driver remains invisible, mounted internally in its own rear box that vents bass energy through dual bass ports to a front box which encloses a larger passive radiator. The piston action delivers low-frequency information that is tight, tuneful, extended and with greater output capability than a traditional externally-ported enclosure, enhancing the linearity of the active bass transducer by reducing driver excursions. Optimised cabinet volumes allow for a crossover network tuned to take advantage of such a design. An internally vented box, with another box in front housing a passive radiator—means that acoustically, the front box becomes a second-order acoustic low pass filter, eliminating the requirement for two orders of electrical network, further reducing driver distortion. This sophisticated engineering means clean, distortion-free, natural, accurate, authoritative bass that defies the norm and challenges for more costly competitors. Two new woofers deliver extraordinary low frequency performance far superior to less complex driver and cabinet solutions. Engineered specifically to work with the elaborate Interport-Coupled Cavity cabinet design, the first woofer is a 6.5" active driver with wideband frequency response. It features an aluminum cone and cast basket assembly with a substantial magnet and voice coil. The aluminum cone is fast, stiff and low in distortion artifacts that otherwise compromise bass realism. Mounted inside the complex cabinet structure, it remains invisible to the eye but its presence is readily apparent to the ear. Partnering with the active driver is a lightweight 8" passive radiator. Front-firing, it is mounted to the bonded-aluminum front baffle of the speaker cabinet and features a stiff aluminum diaphragm and cast basket assembly. Its light weight makes this passive radiator faster and less prone to distortion artifacts than active drivers of similar diameter so it moves air more quickly with minimal coloration. This combination can handle all the power needed to deliver crushing low-frequency crescendos with the dynamic realism of a live performance. 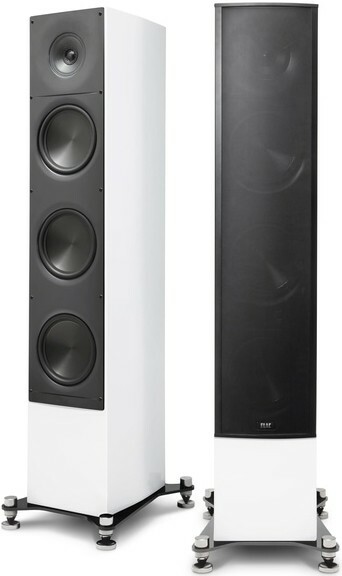 AF-61 employs identical concentric midrange/tweeter and three active/passive low-frequency woofer pairs. ELAC’s proprietary concentric driver technology has been taken to new levels of performance with a brand-new design that delivers astounding point-source accuracy, linearity, power handling, speed and articulation on virtually all types of music. The large, 5.25" diameter midrange cone made of pure aluminum for maximum rigidity with lowest coloration, features a revised profile and generous 2" voice coil that results in greater output level and higher sensitivity than smaller concentric designs. The larger 2" voice coil also provides more room for a newly-engineered tweeter to be situated in the center. This soft-dome design uses new fabric material and employs a wide surround that results in improved lower-treble output, lower resonant and crossover frequencies. Additionally, the whole concentric driver chassis is mechanically isolated from the other drivers and the Adante cabinet itself with anti-vibration mountings that eliminate the transmission of vibration throughout the loudspeaker. 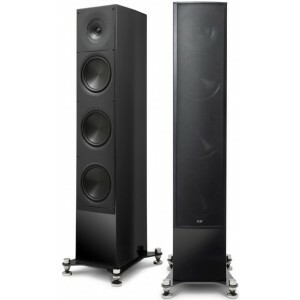 The Adante AF-61 Floorstanding Tower, AS-61 Stand Mount Monitor and AC-61 Center Channel each represent a “clean sheet” design unique to ELAC, where technical solutions, precision engineering and superior craftsmanship all come together to create a breathtaking trio of loudspeakers that sound—and look—like nothing else in the world. Each Adante model is equipped with a dual set of binding posts. A supplied link allows the use of a single pair of speaker cables and only two posts, while dual posts allow the option of bi-wiring with a single amplifier, or choosing bi-amplification with the use of two amplifiers, one for the concentric midrange/tweeter and the other for low-frequency drivers. AF-61 features a custom outrigger base plate in steel with four adjustable spikes.